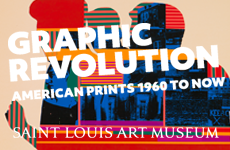 Herrera is best known for ambitious, intricate collages of fragments cut from self-made and found images—comics, art history, pop culture, children’s books. 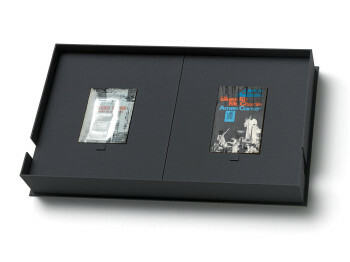 In works such as For the First Time (1999), Night Before Last (2003) and Keep in Touch (2004), cut elements are closely intertwined. A Knock (2002) is part of a series in which he used comics, cutting with the greatest delicacy to create lines that articulate the contours of a dwarf’s hand, a kneeling prince or a candle. ((Collection of the Museum of Modern Art, New York.)) While many artists use collage as an instrument of disorienting jump cuts, Herrera’s sutures exhibit a fluidity much more akin to drawing. This quality comes to the fore in skein-like works made of felt such as All at Once (1999). 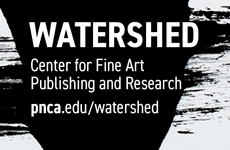 These pieces play with ambiguities of form, with transitions from figuration to abstraction, and with the recognition of subconscious images (the motifs of comics and children’s books are particularly rich examples). Familiar forms are made strange through omission and reconfiguration. The elimination of one picture clears the way for a new picture, as in Say Seven (2000). The resulting oscillation between recognizable motifs and abstract shapes defies any single interpretation. Herrera sets up a dynamic exchange between destruction and construction that is so visually engaging that the works’ subversiveness—the way they undermine the popular language of representation deployed by Disney and others—may go unnoticed initially, lurking in the background. 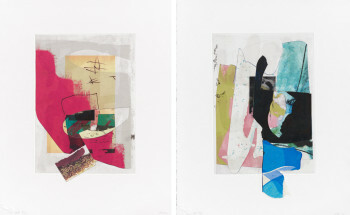 Arturo Herrera, from Berlin Singers (2010), suite of 10 print collages: collage, etching, digital print and screenprint, 30 x 21.3 cm each. Edition of 20. Printed and published by Lower East Side Printshop, New York. He acquired a wide variety of titles: a study of the German Romanticism of Caspar David Friedrich, a book about Yorkshire terriers, a string quartet from 1984 by Ralf Hoyer, a travel guide to Milan, an East German martial arts book—Karate für alle—promising mastery in easy steps demonstrated by combatants attired in the lurid shirts and handlebar mustaches of the 1970s. Top: Arturo Herrera, Caspar David Friedrich, Von Johannes Beer und Karl Robert, 1940 Verlag der Eiserne Hammer, Langewiesche–Königstein im Taunus und Leipzig from Books (inside view) (2012), screenprint and mixed media on paper, 18.7 x 13.5 x .4 cm. 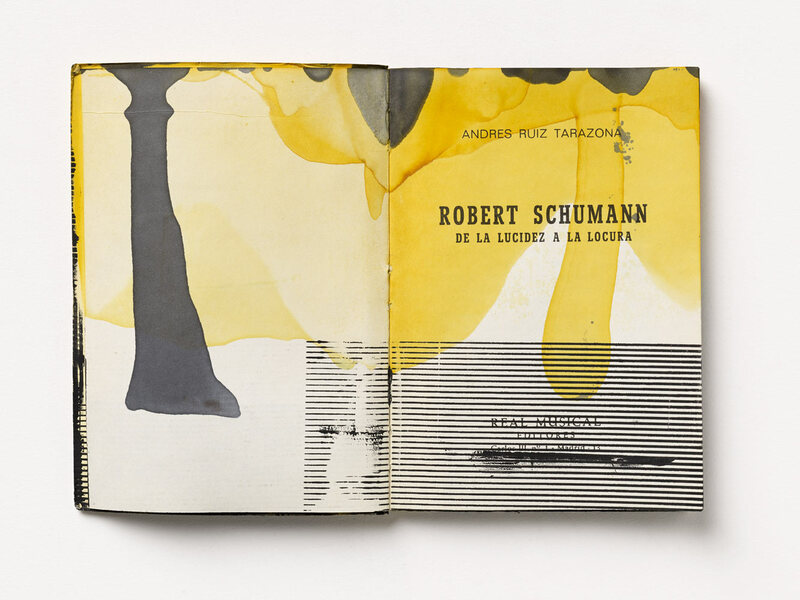 Bottom: Arturo Herrera, Robert Schumann–De La Luzidez A La Locura, Von Andres Ruiz Tarazona, 1975, Real Musical, S.A., Madrid from Books (inside view) (2012), screenprint and mixed media on paper, 16 x 11.4 x .7 cm. 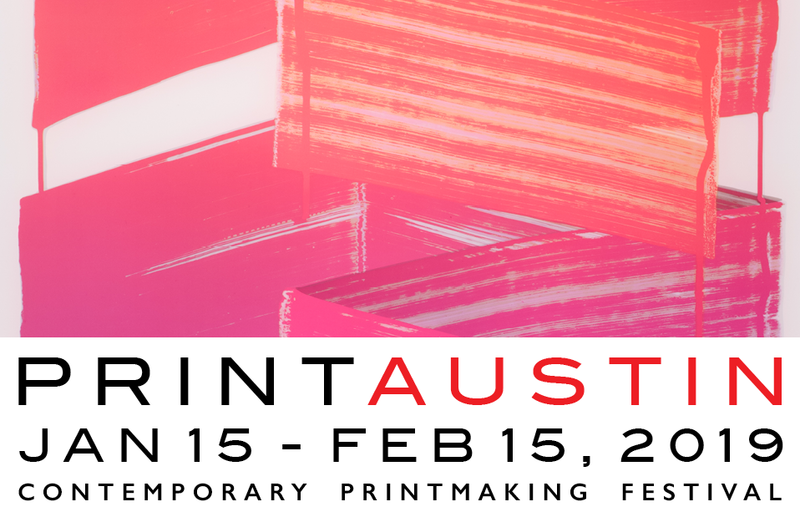 Herrera had worked with screenprint before, but always in collaboration with master printers and professional workshops. The ten print collages of Berlin Singers (2010), produced at the Lower East Side Printshop in New York, employed screenprinted line drawings in an etiolated gray-black that looked, Herrera notes, “like very faint grease stains.” In three enormous and ambitious works done with Pace Prints in 2012, Giuseppe, Richard and Johannes, screenprinted marks embellish large cut-felt shapes that overlay elaborate collages. Though the dense, serrated visual activity and gestural arcs of pigment in these collages suggest spontaneous interaction with found material, each is a meticulously produced edition of interlocking etchings, linocuts, collagraphs and digital prints produced with a team of specialists. In some places the patterns repeat with near exactness; in others they are interrupted by great messy blobs of ink or ellipses where the ink failed to push through the screen at all, allowing the original texts and images to emerge like the sun between the clouds. Often a spate of words can be deciphered between gaps in the pattern, prompting the viewer to imagine the invisible contents. Though the screening is done in an open and improvisatory way, the original pages and the addenda imposed on them abide in thoughtful concordance. 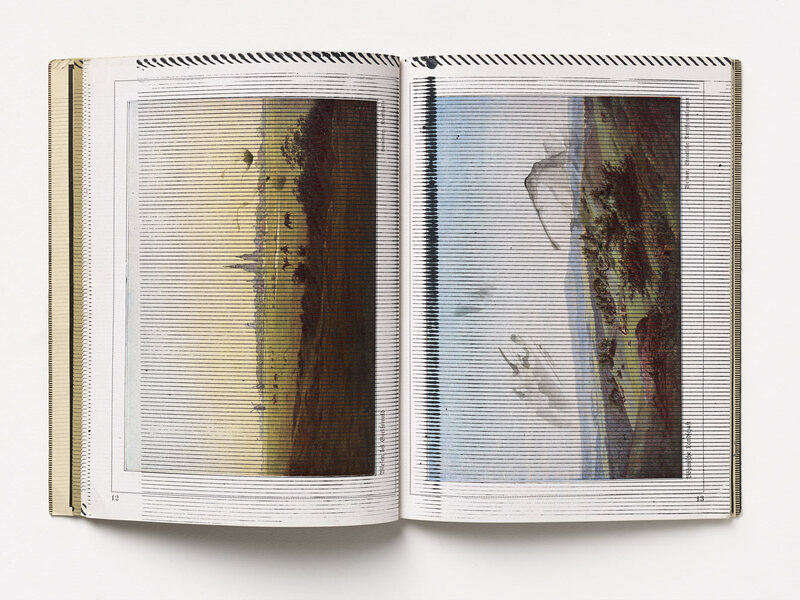 In the Caspar David Friedrich volume, for example, a lightly broken line meanders elegantly across both text and images, while in Karate für alle the impact of martial arts kicks are evoked by a pattern as jagged as a cracked mirror. Neither denying nor romanticizing their past, Herrera breathes new life into these cast-offs. Their power lies in lacunae. They move between nostalgia and reinvention, deconstruction and construction, obsolescence and aesthetics: art and artifact—treasured, trashed and transformed. 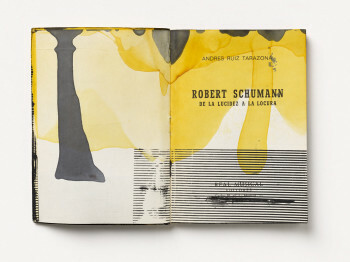 Arturo Herrera, Karate für alle, Albrecht Pflüger, 1985 Falken–Verlag, Wiesbaden from Books (front & inside view) (2012), screenprint and mixed media on paper, 20.9 x 15 x 1.1 cm.